With a dramatic increase in the theft of lead flashing from historic buildings, churches, schools and crematoria, which for the vast majority of time are left vacant, the roofing industry is looking for an effective alternative. To help combat this problem, Manthorpe has launched SmartFlash, a new synthetic alternative to lead flashing. Not only is it more cost effective and easier to install than its lead counterpart, but there is no resale value so theft and vandalism from properties and building sites is prevented. Because it mimics the appearance of lead, it is suitable for installations where aesthetic is of paramount importance. 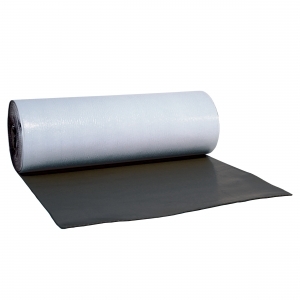 SmartFlash has an integral aluminium mesh reinforcement to aid durability with a self-adhesive layer to the back. This prevents water penetration and eliminates the issue of wind uplift. Highly resistant to corrosion and the second most malleable of all metals after gold, it is the ideal choice to use on any roofing project. The pliable nature of the product makes light work of shaping and cutting, even in the most complicated areas. Due to its specific composition, the product is more environmentally friendly and non-toxic. This makes it safer to handle, with no potential hazards for installers and no contamination of run-off water. Installation can take place in temperatures ranging between –40˚c to 90˚c, and on roofs with a slope of minimum of five degrees. This makes it highly versatile when used on its own or as part of a system. SmartFlash comes in five metre lengths and four handy widths: 140mm, 280mm, 370mm and 560mm. It is available in anthracite grey to blend in seamlessly with the roof. 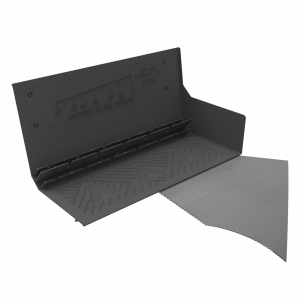 As well as the addition of SmartFlash to the range, Manthorpe is also introducing the Performance range of brickwork cavity trays with an alternative integral lead flashing. This comprises an aluminium grid embedded in an environmentally friendly polymer rubber. Working with this material is comparable to working with lead, only it is even easier to use and shape because of its good stretching properties and low weight. The lead-free flashing material maintains the high levels of malleability and weather tightness that traditional lead provides, yet has the benefits of being lighter, non-toxic and significantly reduces the likelihood of theft. The Performance range is available on short lead applications for use with lead soakers and secret gutted upstands at the abutment. This provides a vertical drop of 75mm and is ideal for use on general details in normal exposure areas. To find out more, contact the friendly Roofing Superstore team on 01752 692 760.